Meter readings and energy-saving notes for dual fuel use at home in 2010. Superinsulating our living room with aerogel should be taking a permanent bite out of energy use and emissions! 2010 data (kWh: e used 1554, e gen -3547, g 5784). 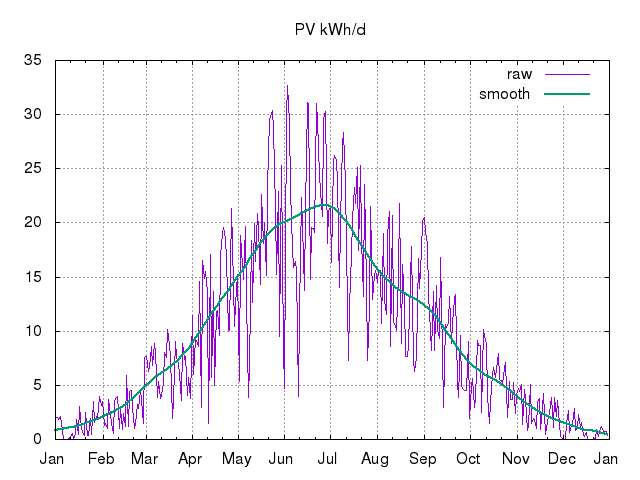 See the daily PV generation logs for 2010 as .csv and .png chart. 2010/01 181 (5.9/d) -42 (-1.4/d) 1233 (40/d) 20091231-18:07-GMT to 20100131-17:30-GMT (31d) Meter readings: electricity generation 42.3kWh, export 25.2kWh, import 164.3kWh (thus net consumption (I+G-E) 181.4kWh); gas 111.070m^3 (so 1233kWh @ 11.1kWh/m^3). SheevaPlug on grid (on mains electricity) most of this month as I was conserving off-grid battery in case we had power outages in the severe weather and needed lighting, etc. HDD12=316 vs 266 last January (mean temperatures 2.5°C or more below 1971--2000 normal), but our gas and electricity consumption was down on last year. I am inclined to attribute most of this reduction to the new internal door, and the blocking of some major unplanned ventilation (ie air leaks), and a little to our new front door and behaviour changes. According to i-measure our primary-energy emissions peaked for two weeks this month (and probably for the whole winter) at 61kgCO2/wk from gas and 21kgCO2/wk from imported electricity, ie ~20kgCO2/wk for each of the four of us. 2010/02 141 (5.0/d) -76 (-2.7/d) 920 (33/d) 20100131-17:30-GMT to 20100228-17:02-GMT (28d) Meter readings: electricity generation 75.8kWh, export 50.8kWh, import 116.0kWh (thus net consumption (I+G-E) 141.0kWh); gas ~83m^3 (so 920kWh @ 11.1kWh/m^3). SheevaPlug on grid (on mains electricity) all month through there was a near-death experience mid-month when the battery LVD was about to switch off but we had the sunniest day so far this year and filled the battery! HDD12=232 vs 203 last February (the BBC says that the UK has had its coldest winter in over thirty years and the coldest February since 1991) but our gas and electricity consumption was down again on last year. 2010/03 154 (5.0/d) -207 (-6.7/d) 694 (22/d) 20100228-17:02-GMT to 20100331-18:02-GMT (31d) Meter readings: electricity generation 207.4kWh, export 165.7kWh, import 112.6kWh (thus net consumption (I+G-E) 154.3kWh); gas ~63m^3 (so 694kWh @ 11.1kWh/m^3). We had the heating off entirely for a couple of days towards the end of March, and dried washing on the line outside a few times. HDD12=165 vs 140 last March, but still less gas used! 2010/04 126 (4.1/d) -378 (-13/d) 213 (7.1/d) 20100331-18:02-GMT to 20100430-17:07-GMT (30d) Meter readings: electricity generation 378.1kWh, export 329.2kWh, import 76.8kWh (thus net consumption (I+G-E) 125.7kWh); gas ~19m^3 (so 213kWh @ 11.1kWh/m^3). We had the heating off from the start of the month, and dried lots of washing on the line! Another grid-tied PV system on the roof went live right at the end of the month, which should get the house very close to zero-carbon. HDD12=82 vs 57 last April, and less gas used! 2010/05 129 (4.2/d) -564 (-18/d) 180 (5.8/d) 20100430-17:07-GMT to 20100531-18:15-GMT (31d) Meter readings: electricity generation 563.5kWh, export 505.1kWh, import 70.6kWh (thus net consumption (I+G-E) 129.9kWh); gas ~16m^3 (so 180kWh @ 11.1kWh/m^3). Export exceeded import mid-month for the new DNO meter pair installed 2009/09. Overnight import ~0.7kWh/d if dishwasher and washing machine not run, else ~2.3. During a run of 4 days of clear skies we hit a generation record of 30.38kWh with similar amounts ~29kWh surrounding it, with peak output ~3.5kW. On other days peaks of over 4kW have been seen (vs nominal 5.16kWp of panels, limited by 4.5kWp of inverters). Total generation since the first PV was put in exceeded 5MWh this month, probably making us 'electricity neutral' since then, with generation on the first meter, ie excluding the newest PV installation, about to pass 5MWh itself in the first few days of next month. HDD12=66 vs 25 last May, and less gas used again implies DHW conservation. 2010/06 132 (4.4/d) -650 (-22/d) 156 (5.2/d) 20100531-18:15-GMT to 20100630-17:56-GMT (30d) Meter readings: electricity generation 649.8kWh, export 578.6kWh, import 60.4kWh (thus net consumption (I+G-E) 131.6kWh); gas ~14m^3 (so 156kWh @ 11.1kWh/m^3). A peak of 32.65kWh was generated on 2010/06/03. The longest day was not a clear day unfortunately, so not a record! Note that gas consumption was very slightly up on this month last year, due to holiday dates. HDD12=8 vs 8 last June. 2010/07 112 (3.6/d) -598 (-19/d) 133 (4.3/d) 20100630-17:56-GMT to 20100731-16:57-GMT (31d) Meter readings: electricity generation 598.4kWh, export 543.0kWh, import 57.0kWh (thus net consumption (I+G-E) 112.4kWh); gas ~12m^3 (so 133kWh @ 11.1kWh/m^3). Used 4kWh/d @ 7p/kWh thus £2 for week's (UK) holiday this month, including immersion DHW in our chalet. Thus total electricity consumption from GB grid actually ~140kWh, ie 4.5kWh/d! Note that the last few miles by taxi of our ~150 mile holiday trip each way cost as much as the rest by (electrified) train(s). This month our living room was superinsulated with aerogel, so should contribute to lower heating demand over winter. HDD12=0 vs 1 last July. 2010/08 124 (4.0/d) -430 (-14/d) 148 (4.8/d) 20100731-16:57-GMT to 20100831-17:18-GMT (31d) Meter readings: electricity generation 429.6kWh, export 374.6kWh, import 69.2kWh (thus net consumption (I+G-E) 124.2kWh); gas ~13m^3 (so 148kWh @ 11.1kWh/m^3). Passed 6.5MWh PV generation (0.5MWh from the newest 1/4) early in the month. So far this year, electricity consumption ~1099kWh, generation ~2954kWh, and gas consumption ~3677kWh, ie maybe a net electricity CO2e footprint of -0.798t (@0.43kg/kWh) and +0.699t from gas (@0.19kg/kWh), ie a small footprint of ~-0.1t. Assuming for the rest of the year (4M/122d) 4.5kWh/d electricity consumption (ie 549kWh), and generation 4/3 that for the same period last year (ie 648kWh), that leaves us with a further -0.043t footprint. To reach zero-carbon we could use that -0.141t for gas heating, ie 742kWh, though after ~5kWh/d gas for DHW/cooking that leaves only ~1kWh/d for central heating! Given that we used 2090kWh for the last four months of 2009, then unless this is an exceptionally mild winter we won't reach zero, quite, but should miss it by less than 0.3tCO2. HDD12=4 vs 2 last August, and the fourth dullest August on record. 2010/09 141 (4.7/d) -318 (-11/d) 180 (6.0/d) 20100831-17:18-GMT to 20100930-17:18-GMT (30d) Meter readings: electricity generation 317.8kWh, export 271.1kWh, import 90.5kWh (thus net consumption (I+G-E) 141.2kWh); gas ~16m^3 (so 180kWh @ 11.1kWh/m^3). Just passed 7MWh total PV generation, and also 3MWh on the export meter (ie over ~12 months) earlier this month. Given last year's 6kWh/d + 3.8kWh/HDD12 gas consumption and 5.3kWh/d electricity, then for this winter I think that we should aim for 5.0--5.5kWh/d+3kWh/HDD12 gas or less and 4.5--5.0kWh/d electricity or less. (Or in other terms, approx 0.95+0.57/HDD12+1.94 = 2.98kgCO2/d+0.57kgCO2/HDD12, or approx 1.01tCO2/y for all but space heating and ~0.61tCO2/y space heating, for a total of ~1.6tCO2, vs ~1.7tCO2 avoided from PV exports to the grid.) These numbers should help see if we are on track even during rapidly-changing demand during the colder months, and would be close to zero-carbon. We have just missed the electricity target but met the gas target (207kWh) this month. PV performance was disappointing but apparently September was a pretty average month including for sunshine. HDD12=19 vs 7 last September. 2010/10 135 (4.4/d) -176 (-5.7/d) 241 (7.8/d) 20100930-17:18-GMT to 20101031-17:22-GMT (31d) Meter readings: electricity generation 175.7kWh, export 141.8kWh, import 101.5kWh (thus net consumption (I+G-E) 135.4kWh); gas ~22m^3 (so 241kWh @ 11.1kWh/m^3). HDD12=62 vs 32 last October. 2010/11 163 (5.4/d) -84 (-2.8/d) 654 (22/d) 20101031-17:22-GMT to 20101130-18:22-GMT (30d) Meter readings: electricity generation 83.5kWh, export 57.3kWh, import 136.6kWh (thus net consumption (I+G-E) 162.8kWh); gas ~59m^3 (so 654kWh @ 11.1kWh/m^3). Gas consumption this month well under target ceiling of 5.0--5.5kWh/d+3kWh/HDD12 gas (limit 706kWh given HDD; actual demand 5kWh/d + 2.7kWh/HDD12) but missed target of 4.5--5.0kWh/d electricity or less. I think that the excess electricity over target is for the central heating pump. SheevaPlug stayed off-grid all month though the SLA SoC indicator has been down to amber a couple of times. 2010/12 181 (5.9/d) -25 (-0.81/d) 1031 (33/d) 20101130-18:22-GMT to 20101231-18:06-GMT (31d) Meter readings: electricity generation 25.0kWh, export 12.1kWh, import 168.5kWh (thus net consumption (I+G-E) 181.4kWh); gas ~93m^3 (so 1031kWh @ 11.1kWh/m^3). Gas consumption this month well target ceiling of 5.0--5.5kWh/d+3kWh/HDD12 gas (limit 706kWh given HDD; actual demand 5kWh/d + 2.7kWh/HDD12) but missed target of 4.5--5.0kWh/d electricity or less; the electricity target probably needs an HDD12 component, eg +0.1HDD12. SheevaPlug was on-grid (on mains electricity) for a total of ~20 days due to very poor insolation (less than half that expected, though the UK as a whole was generally drier and sunnier than normal) and was on-grid at the turn of the year. HDD12=340 vs 250 last December (but gas consumption slightly down); easily the highest heat demand in any one month since we started conserving (the coldest December in 100 years), with only this January coming close (HDD12=316). 2010 total (Jan--Dec) 1554 (4.3/d) -3547 (-9.7/d) 5784 (16/d) 20091231-18:07-GMT to 20101231-18:06-GMT (365d) Electricity consumption down ~20% on last year, generation up ~20%; now ~130%/2MWh net exporters. Actual metered imports 1051.5kWh. Consumption roughly bounded by 4.5kWh/d+0.2kWh/HDD12. Gas consumption down ~7% on last year though very cold (2010 was ranked the 12th coldest year in the previous one hundred years). HDD12 for the year 1481 (vs 1068 for 2009) thus heating efficiency up ~50% from 2009 and maybe doubled since 2008, at ~5kWh/d+2.7kWh/HDD12 cf ~8kWh/d+5.7kWh/HDD12 in 2008.
kgCO2 668kg (1.8/d) -1525kg (-4.2/d) 1099kg (3.0/d) ~0.24tCO2 (~0.66kgCO2/d) gas/electricity emissions total for 4 people, based on 0.43kgCO2/kWh for electricity (netted) and 0.19kgCO2/kWh for gas. Using the DEFRA emissions figures of gas@0.206kgCO2/kWh and electricity@0.523kgCO2/kWh (5-year rolling average) that iMeasure does would bring us to +1192kgCO2 (gas) and -1042kgCO2 (netted electricity) or 0.15tCO2 for the year (37kgCO2/person/year). Our house would probably meet the Zero Carbon Hub proposed 11kgCO2e/m^2/y zero carbon homes standard. First published 2010-01-01 , updated 2019-04-22 . Site copyright © 2007-2019 Damon Hart-Davis. Hosted by ExNet.